The pool will close at 5:00pm on Memorial Day and the 4th of July. Swim areas and pool hours will be adjusted when DeKalb schools are in session. Resident Rate Qualifications: You must live in the DeKalb Park District and provide a valid Illinois Drivers License or Illinois Resident ID Card showing your permanent full-time address. You may also show a utility bill or lease in your name at an address in the DeKalb Park District with a picture ID to receive the resident rate. Pool Season Passes may also be purchased at Sports & Rec or Haish Gym before May 30th. 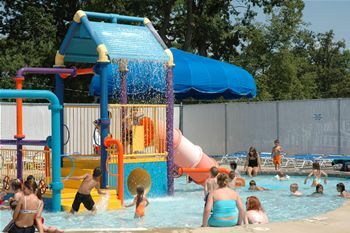 DeKalb resident, low-income families may qualify for discounted pool passes. Download a Scholarship Assistance Form. Scholarship discounts are not available through the online registration system. Please register at a Park District office location. July 11th - August 8th! Escape the summer heat and enjoy extended night swim time with the family as we watch the sunset and the stars come out! Floatation Devices: ONLY Type II & III US Coast Guard approved floatation devices are permitted in the main swimming pool. Children using permitted floatation devices must be constantly supervised and within arms reach. No floatation suits, tubes, or water wings are allowed in the main pool. Life-vests are available to check out at the front desk. Water Slide Height Requirement: All patrons riding the slides must be at least 42'' tall. Pool Closings: Our staff makes every effort to maintain our regular pool hours. Due to cooler weather, severe weather conditions, or lack of patrons, the pool or pool areas may close temporarily or for the day based on management judgment. NOTE: Please be aware of weather conditions. Rain checks for daily admissions will only be issued to patrons who have been in the facility less than two hours and have a receipt. If you'd like to have the entire pool to yourself, or you're just looking for some uninterrupted waterslide time, we've got you covered! You can celebrate a birthday, entertain clients, say thank-you to employees, or host a stress-free family reunion by renting Hopkins Pool after hours any day of the week. Hopkins Pool is available from 6:00-8:00pm on Saturdays and 7:00-9:00 pm Sunday through Friday. * All rentals and parties must be booked a minimum of 10 days prior to the event. * Private rentals are only available before or after public swim and programming times. * August dates fill quickly! Call Scott at (815)758-6663 x7274 to book your rental. 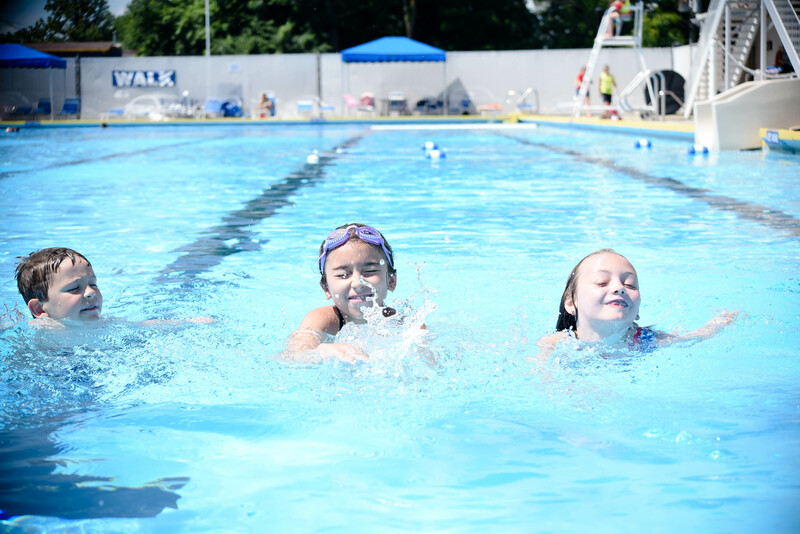 Swim lessons are offered at Hopkins Pool in the summer and Huntley Middle School swimming pool during the school year. Please refer to the aquatics page for all swim lessons and swim program information.